UI prototypes and sketches/mock-ups are really very useful in early stage of Application development (Mobile, Web or Desktop App), it works as a great communication medium between the designers, developers, customers and users. Most of the UI designers/developers prefer – starting with sketches before jumping into the code (HTML, CSS etc). Some designers prefer sketching on paper while some prefer using some tools or both. Sketching on paper is a good practice but if you use prototyping tools, then you can easily create great-looking mock-ups, much faster and of course it’s easy to share and collaborate (for example, in a presentation to your fellow developers, VCs or investors). 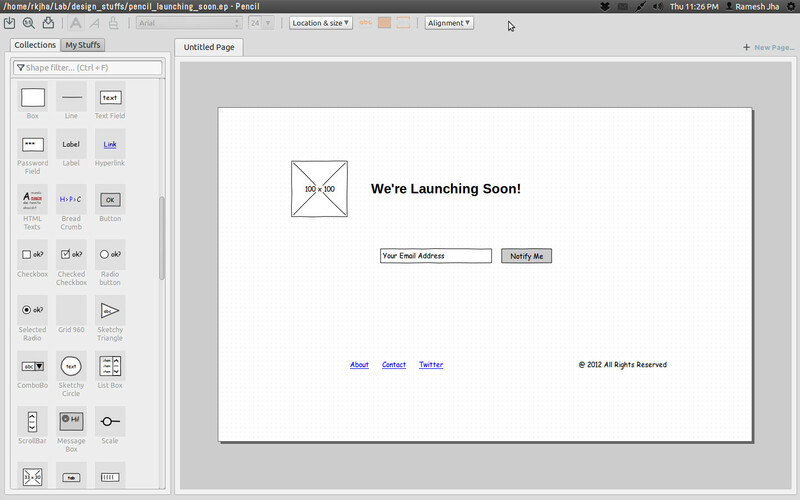 For Ubuntu, native tools are also available, or you can just use the web based mockup tools. it’s a free and open source sketching/prototyping tool. it’s a cross-platform application, available in stand-alone form or as a Firefox Add-on. Pencil has lot of great features – UI elements, icons, etc that allow you to easily create sketches for desktop and web apps. The sketches can be easily exported to pdf, png, odt or templates (such as HTML Templates, but first you need to install the templates, Go to pencil -> Tools -> Manage Export Templates and locate the template downloaded from official site). Download This Add-On (Latest stable version : 1.3.4) and Open with Mozilla Firefox (requires version 4+) to install the add-on. Then restart the browser and go to Firefox -> Tools -> Pencil Sketching and start creating cool sketches as you want. If you want to quickly create mockups for you web/mobile apps, then you should try Keynotopia. 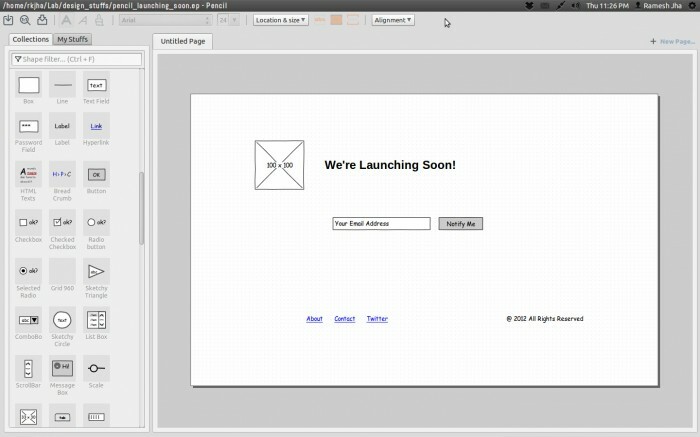 They have lots of awesome templates and wireframing components – so you can transform your ideas into a prototype – in minutes. It works with Microsoft Power Point, Open Office and Apple Keynote. it’s a cool web application, for creating mock-ups and prototypes. it’s easy to use and it has nice widgets and icons to sketch UI quickly. The application is based on Cappuccino, an open source framework for creating desktop like apps in a browser; so you don’t need any flash player or something to use this app. The personal plans starts at $9 but there is also a free plan to get started with (1 project with 10 pages).